Well our tour guide (Emma) had a another very day planned for us. We started with a good breakfast and then we headed out… into the rain! It was pouring just before we left and there were rivers of water running down through the park. 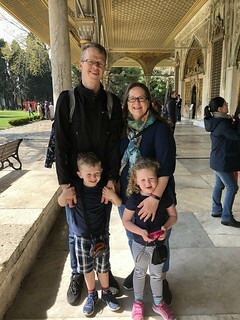 We walked through the park and streets to the grounds of the Topkapı Palace. It is an amazing palace which housed the many Sultans over the years along with all his concubines and children. It is the most beautiful structure with rooms filled with gorgeous tiles, fabrics and windows. Absolutely wonderful to look at but I am quite sure that it wasn’t the nicest place to live. 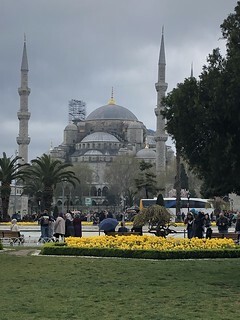 After a quick lunch in the square to avoid the showers we queued in the rain for the Hagia Sophia Museum – also known as the Aya Sophia.A truly beautiful mosque which is no longer used as a place of worship but contains some staggeringly beautiful pieces of art work and architecture. For the first 500 years or so it was a church and then ended up as a mosque. 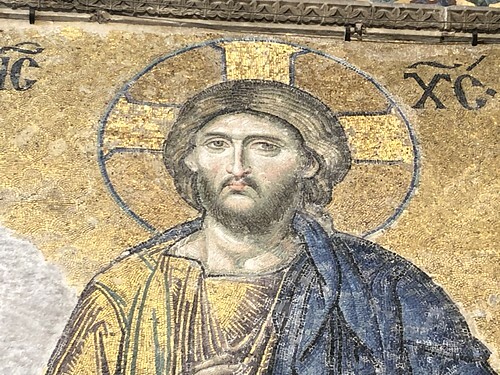 It was beautiful – especially the mosaics which were gold and seemed to sparkle in the light. Gorgeous. 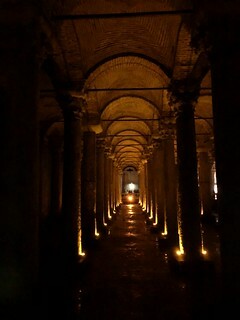 We then dragged the children to the Basilica Cistern which is a huge underground cavern built in the 6th century which could hold 80,000 cubic metes of water. 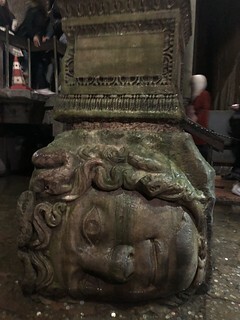 It is beautiful and a little bit eerie and right at the end are two columns featuring intricately carved heads of Medusa. 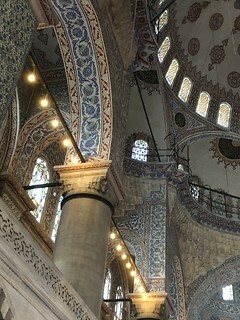 By now the children were flagging so we pushed on towards to Blue Mosque. Still a working mosque meant that we were required to remove our shoes and Emma and I were obliged to cover our heads. A beautifully decorated building it was a little hard to see the scale of the inside due to extensive scaffolding to undertake repair work to the fabric of the building. We ended our day with a walk back through the small roads and had dinner before returning to the hotel at a sensible time. We had to pack as we have a 4am airport pickup in the morning. Ouch!n My legs are definitely aching after 28,000 steps. 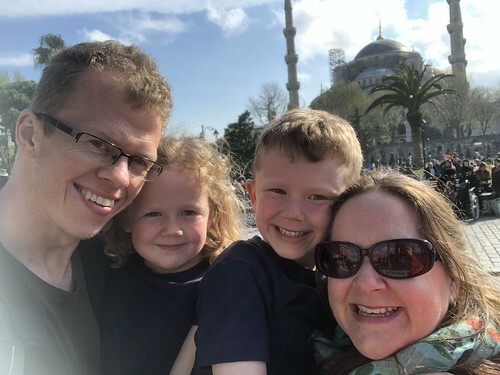 Istanbul has been such a delight – it has impressed me more than I could have imagined. The people have been pleasant, not pushy at all and a pleasure to interact with. The city has felt pretty safe and there has been significant, obvious security at all the major tourist attractions, even the Grand Bazaar. I would love to come back again.